2. Why do some people put those huge antennas on their cars? Are they trying to contact Martians? 3.Why does Wal Mart boast that they have one of the largest workforces yet you can rarely find someone to help you? 4. Why do they say high school is the best time of your life? What is so great about pimples, not having your own means of transportation and having to save your allowance for weeks just to go to the movies? 5. Why do people plaster their last names on the back windshield of their cars? If they are too messed up to remember their own names do they really have any business driving? ahahaha! so funny. i often ask myself a bunch of questions like that too! "i'm a proud parent of a USC student "or something stupid like that..
like who cares, where your kids is going.. 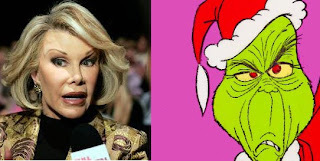 Very good..Everything you said is so true..The Joan Rivers picture, I let out a laugh..What did she let them do to her?